Commercially, oranges can be stored by refrigeration in controlled-atmosphere chambers for up to 12 weeks after harvest. Storage life ultimately depends on cultivar, maturity, pre-harvest conditions, and handling. 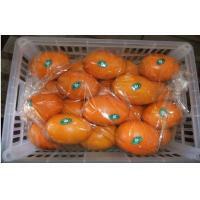 In stores and markets, however, oranges should be displayed on non-refrigerated shelves. Oranges, like most citrus fruits, are a good source of vitamin C.
Oranges, whose flavour may vary from sweet to sour, are commonly peeled and eaten fresh or squeezed for juice. The thick bitter rind is usually discarded, but can be processed into animal feed by desiccation, using pressure and heat. It also is used in certain recipes as a food flavouring or garnish. The outermost layer of the rind can be thinly grated with a zester to produce orange zest. Zest is popular in cooking because it contains the oil glands and has a strong flavour similar to that of the orange pulp. The white part of the rind, including the pith, is a source of pectin and has nearly the same amount of vitamin C as the flesh and other nutrients. Although not so juicy or tasty as the flesh, orange peel is edible and has higher contents of vitamin C and more fibre. It also contains citral, an aldehyde that antagonizes the action of vitamin A, Particularly in environments where resources are scarce and therefore maximum nutritional value must be obtained with the minimum generation of waste, for example, on a submarine, orange peels have been consumed routinely. Since large concentrations of pesticides have been found in orange peels, some organizations recommend consumption of the peel of only organically grown and processed oranges, where chemical pesticides or herbicides would not have been used.